Le Meilleur Pâtissier is back on French TV. This is exciting news, for I didn’t notice the first series existed until I read (snorting with laughter) this blog review, and, as rumour has it this may be series 3, I may have missed series 2 as well. I’m determined to rectify this lack in my life by watching as many of the current series as is possible. I should point out that can’t record it, and French catch up TV may or may not exist and may or may not be functional in the UK. Anyway, for reasons which will become clear, there are limits. I have a love-hate relationship with French cookery programmes (with French TV in general actually, but it’s good for my French, and I pay for the weekly TV listings magazine without which I’d never watch anything at all). I am a slave to the unintentionally hilarious Top Chef, and every week is made better by yelling at Masterchef. Masterchef goes on for about nine years each night that it’s on, and involves cooking for rugby teams, the army, up cliffs, down mines as well as copying as exactly as possible ever more complicated cheffy dishes, while weeping at the mere presence of the many-michelin starred chef who is judging them. After you’ve lost the will to live, and have been reduced to a dribbling wreck, they eventually eliminate a couple of lost souls, who give lengthy speeches about ‘the adventure’, ‘the journey’, ‘inspiration’ etc etc. In the first series, the judges were so rude that the contestants were frequently reduced to tears, and now they are so saccharine that you need a whisky just to cope with watching. Anyway, Meilleur Pât is another imported format, made French, and with it, compellingly and frustratingly random. Meilleur Pât is, as the name does not entirely suggest, The Great British Bake Off, version Française. There are direct borrowings – the entire credit sequence, which has just been photoshopped so that the writing is all in French – the music, though there is a lot more of it, and the general idea of a faaaairly cosy programme, centred around people and their ovens. As with GBBO, there are 3 challenges, including a technical bake, and it’s filmed in a tent with a stately home as a nice backdrop. Mary is now Mercotte, who to me is slightly less steely, but she’s absurdly terrifying for the contestants, who, being French, have a grandmother-food obsession based on the widely-held French myth of all top chefs having being taught everything they know in the kitchen by their grand-mere. You can get books devoted to cuisine des grands-mères. Mercotte takes that and then applies Fear. Paul Hollywood’s role, meanwhile, is filled by Cyril Lignac, who is ubiquitous on French TV, and also played Jamie Oliver in the remake of Jamie’s School Dinners a few years ago. He looks like Gary Oldman in the Fifth Element, and the only time I have come across the name Cyril used seriously before was at a game fair, featuring Cyril the squirrel and his amazing racing terriers (Jack Russells with knitted jockeys tied to their backs chasing a toy squirrel to the theme tune from Benny Hill and one of the funniest things I have ever seen). Needless to say, I can’t get over either of these facts, and I can’t take him seriously at all. Mel and Sue can’t really be recast, as they are unique, so the narrator/stooge/explainer role is taken on by Faustine Bollaert, who, like Mel and Sue, adds some much needed humour into proceedings. She eats less of the contestants’ ingredients and doesn’t do as many knob gags, which I’d say was a failing, but it’s a different type of humour. And she holds the whole thing together and makes it bearable, frankly. So what’s different? Why ‘bearable’? Well, there’s format: the short contextualising films are gone now. They invite a guest judge on for the last round, who makes faces and glares a lot. Oh, and it lasts THREE HOURS. And then there is a behind the scenes programme which lasts another hour or five (I don’t know: I go to bed at that point). At times, each challenge feels like you are watching it in really real real time. Achingly real real time. About halfway through you feel yourself slide slowly off the sofa and you reach for a book. By the time they get round to actually sending someone home you’ve seriously lost the ability to care. The other major, and culturally fascinating difference, is that all they cook is pastry. I mean, yes, the pâtisserie bit in the title would suggest an emphasis on sweet, dessert-style niblets with perhaps the occasional foray into cake – the things you’d expect to find in a pâtisserie – but you might also just maybe expect a bit of other baking, non? Absoluement non. Where the British has themes weeks – bread, pie, biscuits etc – the French version applies all that mind-numbing lengthiness to the same thing every week. No bread. No pie. No baked puddings. I keep hoping for a crumble, but although the French have now embraced (and changed for the worse) Le Crumble, nary a decent buttery crumb have I seen. Sometimes, the contestants are forced from their comfort zone of standard French classics, to do a regional or slightly outmoded technical challenge, or, worse still, something not French – the sachertorte was met with gasps of horror and staggering. I am alternatively warmed by the depth of their devotion to what is a massive range of pastry-based products, and appalled by the narrowness of their culinary aspiration. I’m not exactly surprised by the structure though. It’s hard enough for the average French person to contemplate making pâtisserie at home, given how easy it is to buy exquisite goods locally in most towns. Making bread would be a step too far. Bread is utterly enshrined in the French culinary mentality – bread riots contributing to the Revolution, bread prices set by law, municipal bread ovens still extant in many villages across France. When fishing seasonally in Newfoundland, the Brits built themselves houses, and the French, bread ovens. Predominantly sourdough, vs the Brit yeasted doughs (it’s all about the prevalence of brewing and, later, internal communication networks), predominantly white vs the granary or seeded loaves of upmarket British bakeries, and always, always, professionally made by people steeped in general traditions of French baking, why o why, would you ever cook it at home? A different rationale applies to savoury stuff. By its very nature, the pâtisserie that the contestants are cooking is that which is cooked in pâtisserie shops across the land. Their repertoire, comfortingly familiar to the tourist seeking their Mille Feuille hit wherever they go, was laid down following what amounts to invention of pâtisserie as we’d recognise it today by Cârème in the early 19th century. Pâtisserie is about fantasy, foodstuffs emerging from the ethereal sugarcraft sculptures of the late 18th century dessert table, and before that the Tudor banqueting course, with its edible sugarplate tableware, and exquisitely moulded marmalades and spiced fruits. What could be more fantastical, and less useful, than puff pastry layered with sweetened cream and custard? Or chocolate cream-filled miniature nuns? But, gosh, what delight they give. A sturdy game pie, stuffed with quinces and pigeon and made moist with mushrooms and suet, isn’t quite in the same league (though, on balance, I’d probably rather have the pie). So the contestants in the show make fantasy food which has no real use other than giving pleasure at the moment of eating. It’s all about instant gratification. I suppose you can argue that the Brit version is mainly cake and frippery, and the very nature of TV is that it focuses on the instant: a common complaint about every cookery show on TV is that they privilege quick cooking methods over slow cooking because it’s more exciting for the viewer and allows challenges to be over in 30mn. But it does mean that Meilleur Pât, in all its lengthy glory, is essentially the same programme every week, which, after you’ve mused on cultural differences for a bit, is a tad tedious. And all that sugar just leaves me craving cheese and that most British of culinary icons, marmite. Seriously. Marmite. Yes. The presenting trio in all their glory: Mel/Sue, Paul and Mary revisités, as it were. 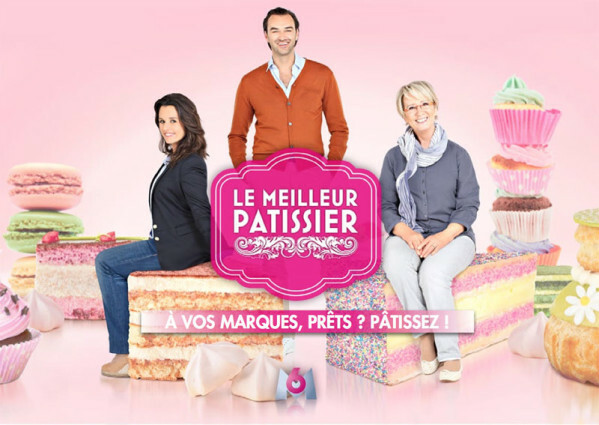 The link to the official website is here: http://www.m6.fr/emission-le_meilleur_patissier/ – next week the trailer suggests they are making meringue penises, so that should be mildly interesting.